So I’m going through several boxes right now and the guy I bought everything from has most of the original marvel comics! 37-155 are accounted for as well as 1-4, 7, 21, and 27. They are in great shape! Now it will be easy for me to complete the whole run! Categories: New Joes | Tags: comics, G.I. 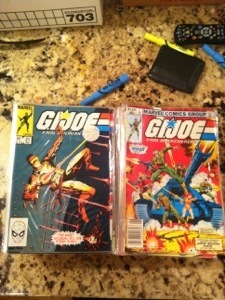 Joe, GI Joe, GI Joe Comics, Leaky Suit Brigade | Permalink.